Probably most people would be put off if their carefully and meticulously thought out plans for the day were washed away by a sudden downpour and they were forced to abandon them. I am no different. My book-hunting stint had taken me to Malviya Nagar today. I had been searching for this particular book since long and finally when I came to know about an old edition available, I couldn't have let it go. So I took a half day Casual Leave from office and set out for Malviya Nagar. However, I didn't know the way to that particular bookstore that well. I had only heard about it on a Facebook reading group that it was based out of a basement in a private colony in Malviya Nagar. After alighting at the Metro station, I had barely walked a few metres and was still trying to figure out the correct street to take when a sudden downpour out of nowhere sent me scurrying for cover and all my plans were dashed. I couldn't continue with my search for the book store and hence the book. I was definitely upset. I took shelter outside a shop's corridor and decided to stay back and wait for the rains to stop before I could start for home. Just then, my eyes fell on a little boy who had set up his make-shift shoe polish shop, under the bus-stop facing the shop, a few metres away. He was noticeably thin and was wearing a tattered, overly large shirt and a worn out trouser that had been folded upto his knees. He would have been barely 11 or 12 years old. Had he been financially well-off, he would have probably been busy spending the afternoon at home, playing video-games or watching TV like most children of his age do. Instead here he was, working hard to make ends meet. But he had a striking, warm smile pasted on his face all the while. I wonder how much he would be earning in a day and I doubt whether it would be enough to feed himself and his family. By now, it had begun to rain more vigorously. My eyes were still locked on him. Now that it was raining, the boy probably thought that not many customers would be coming to him, so he decided to have his lunch. From a gunny bag that lay beside him, he took out a cloth wrapped tiffin-box and laid out his lunch to eat. He was just about to take in the first morsel when he saw a skinny stray dog, completely drenched in the rains, trying to take shelter under the bus-stop but the people waiting there were shooing him away. The little boy was kinder though, he gestured the dog to come nearer and coyly the dog went to him. Not only did the boy pat the dog dry with a cloth from his gunny bag but he also shared his lunch with him. I wish I had captured those soul-touching moments in my cell phone but I was completely lost in them. It was heartening to see that the hardships of life had not affected the child's humane side. Some of us though have become so self-absorbed and materialistic that at times, it seems like our hearts are bereft of compassion and empathy for the sentient life forms. So often we make the mistake of seeing the world only through the lens of possessions. Life no doubt is a continuous struggle. However one isn't rich by what is in his/her wallet, rather he/she is rich by what is in his/her heart to give to or share with others. There are heroes everywhere, there are good Samaritans around too but every once in a while we come across an unsung hero who mayn't have done anything extraordinary but good enough to elicit admiration. It speaks a lot about someone by the way he treats the most unfortunate among us (even though he himself is equally deprived). 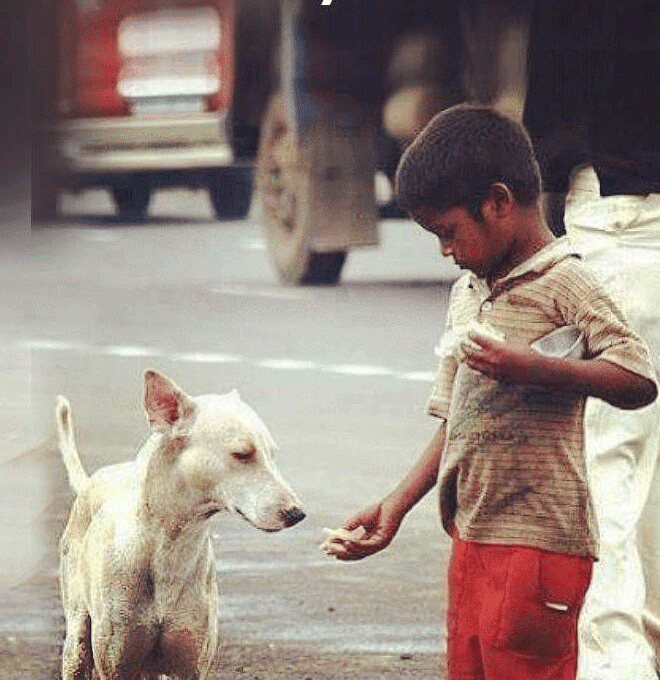 That boy may be a pauper, he mayn't have been blessed with much fortune but he has surely been gifted with a heart of gold. He probably hasn't got any clue either of what tomorrow has in store for him. But he definitely isn't indifferent and cold-hearted like some of us well-off, educated people have become over time. As a Scottish proverb goes, "Do not judge by appearances; a rich heart may be under a poor coat".